Let Anna take the stress out of your wedding day with her professional and practiced approach to supporting couples on their big day. 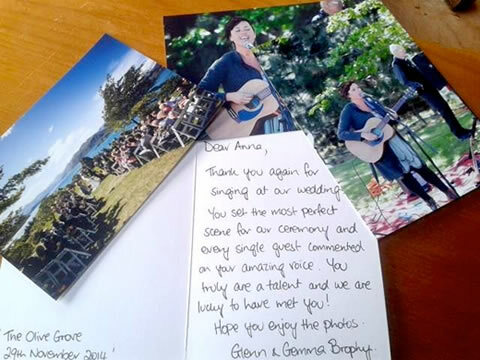 Known as Wanaka's most established and experienced wedding singer, local performer Anna van Riel has a passion for helping couples to make their big day simply magic. There's nothing quite like having someone sing your bride up the isle and into your arms. Anna specialises in bringing that emotive and memorable magic to your ceremony, followed by a summery, feel-good collection of contemporary covers and originals to entertain you and your guests over canapés. Choose from one of Anna’s specially created music packages in order to get the perfect feel and sound for your wedding day or event. Read about them below then contact her to arrange what will suit you best. Anna is renowned for her personalised songs, commissioned for couples on their big day. As an award-winning songwriter, Anna takes immense joy in the privilege of writing the sound track to your wedding day. Simply call or send Anna an email with some of your favourite memories with your partner, including some words about what you love about them, then let her do the rest. If you’re choosing to elope on top of a mountain range, tucked away in a secret valley, or in a secluded olive grove, Anna can offer a rich sound with a small, efficient and battery-powered PA system. Compact enough to bring in the chopper or throw over her shoulder, you can have the quality of sound that gives your precious moments the perfect volume and feel. Feeling sure-footed plays a huge part to the success of your big day. Step down the isle with complete confidence knowing you've stepped it through with Anna's calm and practiced approached to choreographing wedding rehearsals. 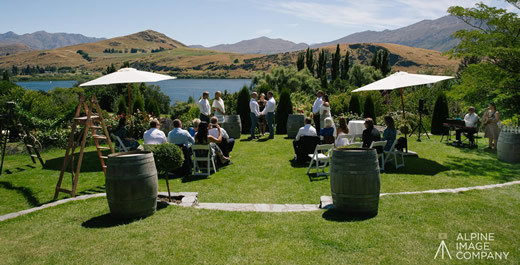 Offering a larger PA system than on her remote locations, Anna performs a collection of feel-good songs to set the scene during canapés and receptions. 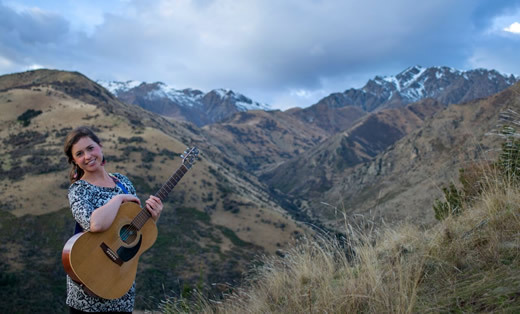 Solo, Anna performs with guitar and ukulele and weaves a collection of covers and originals to create a warm, welcoming and heart-felt atmosphere for you and your guests. Her melodic and moving vocals bring the emotion and presence to your day. As a duo or band, Anna and co. perform lush harmonies and keys and/or lead guitar to offer a full-bodied sound and groove. Find a downloadable copy of Anna's set list below. Choose from any one of Anna's specially created music packages to get the perfect feel and sound for your wedding day or event. 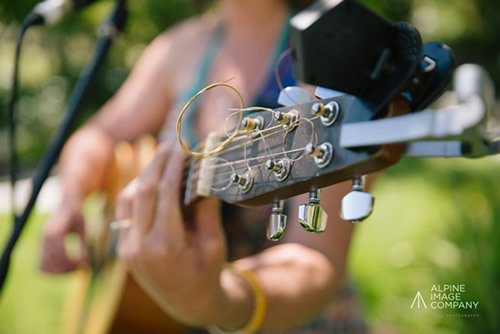 Anna offers acoustic solo sessions, duo and band performances with professional local musicians. Packages can be adapted to suit your needs. Please email Anna to chat about what fits in with your vision. Read Anna's packages below to find an option that will best suit your needs. Have a read of what happy couples have to say. 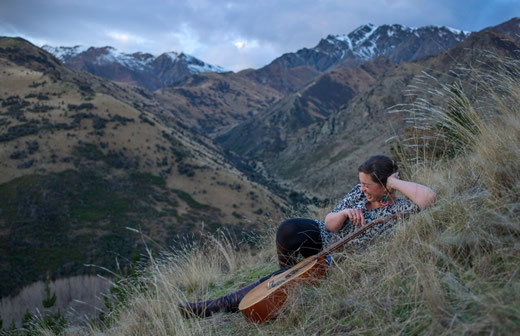 Anna recently played at our wedding Wanaka for a few hours during our very cosy reception. We had a small intimate wedding with just 2 families as our guests, Anna was perfect for our special day, we gave flexibility with what Anna played and fully trusted her to play to the mood of the afternoon...we certainly were not disappointed...she was spot on. From the word go upon contacting Anna via email, she was responsive and enthusiastic in every way. I commissioned Anna to write a song for us as a couple and what a beautiful song she produced called "Peter Pan". So fitting for us both and with such a stunning voice, she took our breath away when she performed it for us at our venue. Anna is a wonderful singer with an amazing voice and a friendly persona to match! She brought such a warmth to the occasion and I would highly recommend Anna for any occasion...without ANY hesitation at all. Thank you for adding some extra sparkle to our special day as the person you are and with your incredible singing. We had Anna van Riel sing while we signed the registry on our wedding day. The song was written by Anna especially for our day and was an amazing gift that friends and family were able to share with us at an incredible moment in our lives. I remember it every time I hear our song and love the feeling of uniqueness it brings.